When I was asked to write a reflection for the Society's Year of Prayer in honour of Philippine Duchesne, I chose to focus on her profession cross. 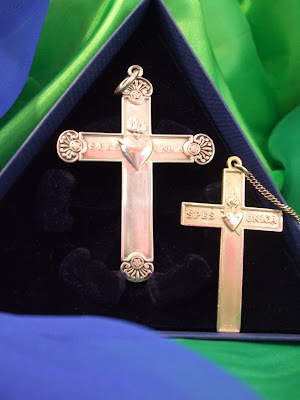 This cross - subsequently worn by Anna du Rousier, and later by Janet Stuart - had spent some time in our province during the Janet Stuart centenary events in 2014, inspiring us with its simple presence, which told of the great-hearted, God-centred women who had worn it. The pre-Vatican II crosses were larger and more ornate than the ones we receive now, as was evident when I placed mine beside Philippine's. The effect was akin to placing a tortoiseshell cat beside a tiger: a disparity in size and effect, but at depth a striking similarity; they are, fundamentally, of the same genus and substance, the same evolutionary trait. The same insignia and mottos bind our crosses - bind all our crosses, across the centuries - and bear witness to the enduring continuity of a vocation and vowed commitment which are, at heart, completely the same, however differently they might be expressed two hundred years later. This continuity was picked up by some of the RSCJ who wrote to me after my reflection was published, and whose words have nourished my ongoing pondering. One wrote that her own cross had originally been worn by a sister she had never met, but whose life, she knew, had been spent in contemplation and largely hidden service. My cross is also inherited, although I knew its former wearer, of whom I was very fond: when "her" cross became "mine", I like to think that something of her fidelity, deep prayer, perseverance and indomitable spirit came with it, along with her amusement at life - and, yes, her flaws too, all part of her steadfast commitment, lived in faith. But I was also reminded of something else, which I'd only heard about recently, in passing. Apparently, a lot of the old, pre-Vatican II crosses, instead of being left to languish in boxes, were sent to our generalate in Rome, where they have been melted down and formed into "new" crosses. Thus, anyone receiving a shiny, gleaming new cross receives, in reality, something much older and more precious, in which are intermingled the crosses of missionaries and stay-at-homes, of unsung mystics and anonymous administrators, of revered teachers and reverend mothers, and nurses and cooks and sacristans. But more than this: contained within those new crosses are the prayer, suffering, struggle, fidelity and generosity of a multitude of women, who, across two centuries, gave their lives for the greater glory of the Heart of Jesus, and the revelation of his limitless love. A continuity of call we all share, whatever the age, size and provenance of our cross.